Desperation added to desire can be a combustible mix. It might result in success, but it often results in catastrophe. People driven to desperate measures simply don’t give up, and that is so evident in the decades long struggle to control illegal immigration from Mexico to California. 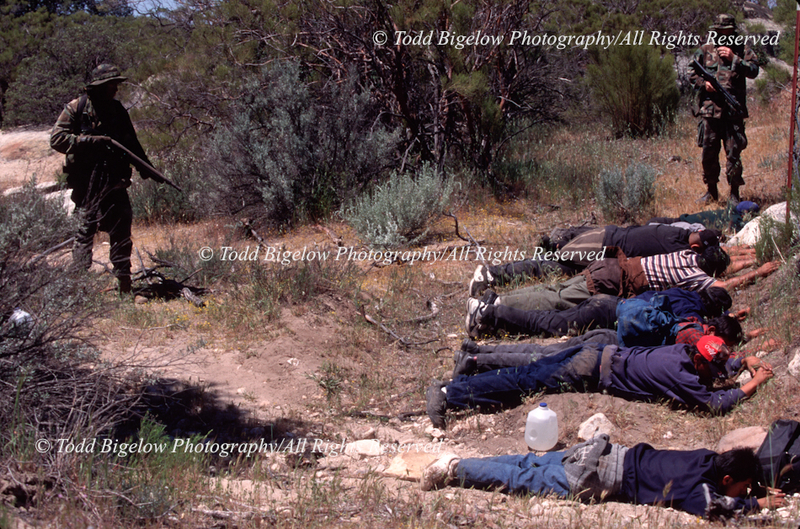 There are those who have spent more years photographing the perils of migration to El Norte longer than me, but I’ve been at it long enough to have seen the escalation of desperate means undertaken by smugglers and their human/narcotic cargo to reach the U.S. And it just doesn’t surprise me. 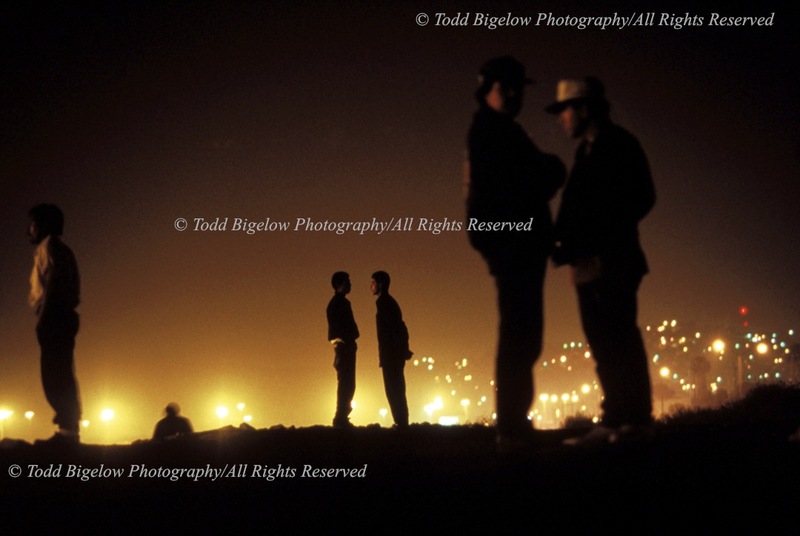 Back in the early 90’s when I first began documenting the immigration issue migrants would simply gather on the Tijuana Levy, just inside the US but within paces to the easily-scaled border fence, and wait for midnight shift change before making a run through the dry riverbed and into a sleeping San Diego. Then the Clinton Administration launched the much hyped Operation Gatekeeper to stop the migrants. Heralded by less than enthusiastic field agents as “Sitting on an X,” the plan was to flood the region with agents and stop the migrants from their easy entries. Thus began the first escalation in migrants’ desperate attempt to enter the country. With the easy route closed, Operation Gatekeeper was instrumental in pushing migrant smuggling into the hungry hands of Mexican organized crime. With land routes now taking days of trekking across vast desert and mountains 80 miles east of San Diego, migrants were forced to depend on smugglers to get them across. Obviously, the price went through the roof. What once literally cost a few dollars to a entrepreneurial gangster guarding a hole dug under the fence in San Diego now cost the migrants thousands. En route, smugglers encountered deadly heat, drownings, winters in the single digits and heavily armed private patrols. But, still, that didn’t deter the migrants who, increasingly desperate, sought new ways to enter the country. A shift from the San Diego sector to the Nogales, Arizona region was no easy task. Migrants now faced similarly long journeys through the searing Arizona desert, citizen patrols and a Border Patrol build up that shifted from San Diego to meet the “new” problem area. Unsurprisingly, the migrants and their smugglers shifted gears again and ramped-up their desperate moves by taking to the sea. A couple of years ago the Dept of Homeland Security allowed a bit of access to their operations as part of a TIME piece on migrants taking to the sea. Flying over wakes in complete darkness as they traversed the coastline along the US/Mexico border, agents scanned the ocean for illegal activity. Increasingly, smugglers are loading their cargo in pangas, open hulled Mexican fishing vessels, and running lights out up the coast where they send the migrants scattering into the surf along popular beaches including La Jolla, Malibu and even Santa Barbara, before u-turning and heading for Mexico. Pangas are often found deserted on the beaches as well. But just the other day, desperation reached a new level as a smuggler decided to ram their panga into a Coast Guard inflatable that had been dispatched to investigate. The collision killed a member of the Coast Guard, the first deadly encounter at sea between smugglers and the government. It looks like a new escalation is rearing its ugly head.